Free your words. Find your people. During our December poetry month, I was introduced to so many amazing published and aspiring poets through social media. Through websites like Re:ad Poetry, finding modern poets online is becoming more accessible, opening doors for writers to get their words out into the world. Jessica Semaan’s words completely threw me off guard. I stumbled upon her through Instagram, which lead me to her Medium profile, where she shares a number of her poems. Her brutal honesty about her heritage, her body, her relationships, her life as a woman, completely captivated me and made me feel personally connected to her…you know that beautiful power poetry has. Child of the Moon, Jessica’s collection of 150 poems, will be released on January 8, 2019. After reading her work, I quickly reached out to her, as I felt compelled to make a connection. I read so many poems during December and very few touched me the way Jessica’s did. I’m grateful that she is sharing herself and her words with all of us. 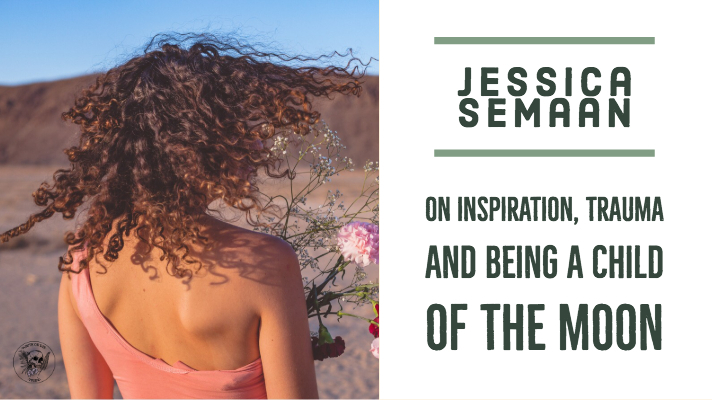 Thank you so much Jessica for also sharing with our little community and allow me to interview you for our tribe! Click the link to pre-order her book or follow her via Instagram here. One of your poems, “I am tired of teaching men how to feel” just blew me away. It resonated with me so deeply and I found connections within my own self that you were able to describe on the page. Why do you think women tend to give so much of their emotional selves away? What inspired you to write such a moving poem? My ex inspired. And honestly, all the men I dated. They expect us to do the work as women, the emotional one. I believe both the patriarchy and capitalism are to blame The patriarchy, because it expects women to do all the work, and men have the privilege too. Capitalism, because at its core it is about repressing emotions, and consuming to fill the holes within us. To feel and to know your feelings are not valued. And therefore most people don't do their work. Especially men, who are the makes of capitalism. In January, your illustrated collection of poetry “Child of the Moon,” will be released. Congratulations! Can you speak about your writing journey? Did you always know you wanted to be a writer, a poet? What drew you to poetry? Not really. When I was 13, my french teacher, shared with me that I have a talent for writing. But I only started writing again 17 years later, following a depression and a burn out. The book came organically. I was deep into healing my childhood trauma and an agent reached out to me. If you asked me two years ago that I would have a book in my hand, i would say you are crazy. What was your writing process like during the creation of your poetry collection? Honestly the writing poured out of me, during times of deep pain. However with the publisher we edited a lot. It was so fun to revisit the raw writing. What is your connection to the moon? Why is it important to you? What does it mean to you to be a “child of the moon”? The moon represents to me the constant unconditional love available out there in the world. Every time I feel down, I look up and often see the moon just there, and I know I am not alone. Also being from the Arab region, the moon represents spirituality for us. You speak a lot of trauma within your family and abandonment, in your work, two very emotional and personal topics. Why is it important for you to be vulnerable in your work and share these parts of you? Has writing poetry helped you heal? It is important for me to share my story for two reasons: de-stigmatizing and bringing awareness to childhood trauma and its impact on mental health. The second reason is to ensure people don't feel alone in their pain. Loneliness in pain feeds shame, which feeds desires to take one's own life. Writing poetry helped me process my emotions, and digest them through words and imagery. Poetry is the language of the heart. You describe yourself as a Lebanese poet. What do you love most about this part of you? How has claiming your roots and embracing your heritage affected your poetry? I love and hate my country. It is a reflection vis a vis my relationship with myself. Lebanon has been through so many wars, within and around, and it remains resilient. The people love life, and enjoy it. On the other hand, there is a lot of chaos, disorganization and avoidance of pain. What advice do you have for aspiring writers and poets? Write all the time. Who cares if it is good or bad? Or happy or sad? Write for you. Maybe write for a lover. But please write.